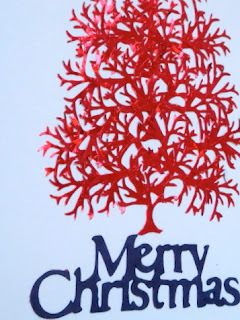 In previous posts I have shared with you many, many years of my handcrafted cards. As you looked through them you could see my style reflected in many different ways. You can tell I am drawn to geometry, and classic forms. 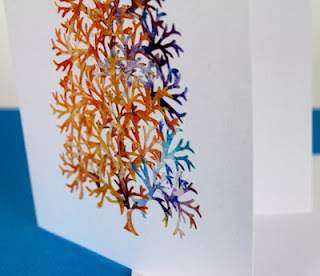 If you like handmade cards I encourage you to spend some time roaming through Etsy. 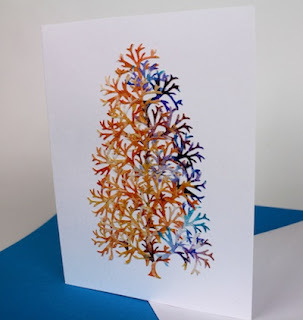 You may not want to make your cards but there are many talented people that make and sell beautiful cards. When you give this type of card, the card is enough to be the gift! For my recent birthday (ugh!) my daughter Karen did just that. She went searching on Etsy for cards she thought I would love, and bought me one each of a collection. They are beautiful, varied, and very exciting to receive. Today I am going to highlight the work of Janet Church from Jacksonville Florida. She builds up beautiful trees from many smaller trees cut from gorgeously colored paper. Karen gave me one that mimics the changing seasons with a stunning array of colors but Janet also makes holiday appropriate designs. They are beautifully crafted. Check out her work at KraftyNoteAbles.etsy.com or her blog here.